A hidden safe can be an important part of a comprehensive home security system. Disguised and concealed safes are always advantageous over conventional safes, since they are often not even discovered by thieves, preventing intruders from using violence or coercion to force home occupants from opening the lock. Concealed safes must be resistant to all attempts at forced opening, but more importantly, must be effectively camouflaged from view, by clever placement. This article provides guidance on the purchase, use and location of hidden lockboxes and safes in the home. 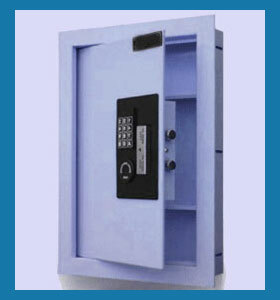 Concealed safes come in a huge array of styles, sizes and security levels. On the low end, there are fire-resistant lock boxes disguised as common household items, such as cleaning products, books or even small pieces of furniture. These security devices are typically most effective when placed right out in the open. In the mid range, there are wall and floor mounted security boxes, typically also fire-resistant, which can be easily concealed with a piece of art, throw rug or carpet. These devices work well in areas which do not arouse suspicion, such as in the floors of closets. On the high end, there are full fire proof rooms, which also can serve as emergency panic rooms in case of a home invasion. These expensive home security additions are often designed into custom homes on the request of the builder or owner. They can also be retrofitted to existing structures, but the cost is usually far greater. Most residential concealed safes are used for keeping important and irreplaceable documents, such as birth certificates, insurance policies, wills, marriage licenses, passports and loan documents. Many people also keep cash, gold, jewelry, bonds or stock certificates in their home safes. Firearms can be kept locked up to prevent accidental discovery by an invader or child in the home. Large safes can be used to store objects of art, paintings, furs and other bulky, but pricey items. Obviously, the largest hidden panic rooms can provide emergency shelter in case of home invasion, natural disaster or even terrorist threat. Concealed and disguised safes and boxes certainly are an asset for protecting your home and valuables from theft and fire. If an obvious safe exists in your home or business and thieves do force their way in, you can be sure they will try to persuade you to open the lock using whatever force necessary. If they never find the safe, there will be no need to put yourself, or your family, in this perilous position. Make sure to keep your concealed safe a real secret and do not expose it to the prying eyes of people who might be working in your home on a temporary or even long-term basis. If you can not afford an elaborate disguised safe, there are still less expensive, but equally effective, small containers for hiding small valuables right in plain sight. Most of these disguised canisters are designed to look like common items found around the house, but have the added benefit of a hollow space to store keepsakes and cash, free from the risks of theft and damage.